Imagine telling a story, mostly fictional but with a sprinkling of facts, so plausible and compelling as to be taken as true and internalised by whole societies — societies proud of their preeminent science and enlightenment. Imagine telling a mostly fictional story that is adopted and championed even by professionals, academics and major societal institutions, including governments; a story in which millions of citizens are deemed to suffer from psychological conditions termed in the story as ‘mental illnesses’, which must, at the cost of billions of dollars, be medically diagnosed and remediated by doctors, ‘mental illness’ professionals, and drugs of questionable safety and even more questionable efficacy. Well, as it turns out, this happens to describe the origin and reality of our present mental health system, beginning with a largely pseudo-scientific narrative followed by and necessitating a chain of responses and expenditures. This narrative and its resultant system have become the predominant and accepted response of Western societies to the distress and difficulties of common human experience; both narrative and system have been owned by medicine and health institutions as the preferred approach to ‘mental health’, and have been afforded the status and legitimacy of evidence-based science, purporting to benefit human psychological health and well-being. 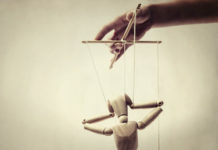 This article explains why we should be deeply disturbed by this largely fictional narrative and its resultant system; why we should be suspicious of who actually benefits from the whole enterprise; why it is a largely unnecessary burdensome cost to our economy, and, most importantly, why we can no longer countenance the unconscionable toll it takes on the psychological health and well-being of ordinary citizens. Are we really succumbing to a pandemic of mental illness, or is there another explanation for what is happening? Well, what so many ordinary citizens (non-mental health professionals) have suspected for some time actually goes right to the heart of the matter: that perhaps there is a problem with the way we have come to define and respond to personal distress — including psychological and emotional difficulties which previously would not have been the domain of medical intervention and diagnosis, and would have been largely resolved with various forms of non-medical human support. Augmenting this idea with some closer analysis of the mental health ‘industry’, what we discover, contrary to what we have been told so often, is not a crisis of mental ill-health at all, but the effects of a deeply flawed narrative of ‘mental illness’, directly related to the systematic medicalisation of common human experience. Put simply, a whole gamut of common, albeit sometimes very challenging and disconcerting human experience has been corralled by medicine (and in particular its specialty of psychiatry) and referred to as illness; and where there is illness, treatments and especially drugs are utilised to attempt to cure it. Had this been a sudden event or decision of governments it might have been seriously questioned, but unfortunately, it is a phenomenon which has crept up on Western societies over recent decades. To use the words of poet Francis de Quevedo, it is one where not only are things not what they seem, they are not even what they are called. 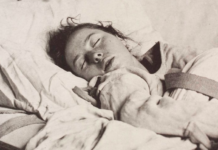 The endeavour of detecting, understanding, diagnosing and treating physical illness is the hallmark paradigm of modern medicine, and one that has shown itself in many ways to be of remarkable merit. However, this approach, though persistently applied to psychological difficulties (or ‘mental illnesses’ and ‘disorders’, as they have been termed), has shown itself at best to have quite limited benefits. When applied to the highly complex individuality of psychological experience, which reflects a changeable interplay of mind, emotions, behaviour, physical sensations, and factors of social and physical environments, it quickly finds itself out of its depth. Attempting to shoehorn this dynamic complexity into static psychopathological illness categories, it is forced to depart from science into untenable reductionism; some would go as far as to say, pseudoscience. This tendency of reductionism expresses itself in another disturbing way: medicine views an individual mostly as an organism to which a diagnosis and treatment is applied, rather than a person of unique complexity who is also a self-acting agent, living in a demanding world and environment which impact on and are integral to their daily life. No person exists or experiences apart from his or her world and others with whom they relate. Consequently, we can never dispense with context or wider determining factors as if they are appendices of questionable value or a mere curiosity in the enterprise of responding to mental health difficulty. When a person seeks out a doctor or a therapist because they are in distress or are encountering a mental health difficulty, they do so with a known sense of their personal history, their whole being-in-the-world, and every aspect of this is interrelated in some way. There is a common illusion that we somehow increase our understanding of a person if we can translate a personal understanding of him or her into the impersonal terms of an organism or system comprising of a sequence of processes. This is an erroneous perspective. The medical approach is inadequate in dealing with the person in this regard and exhibits an inveterate tendency to depersonalise them and render a reductionist account of them: an isolated set of symptoms to be treated, rather than seeing them as a resourceful self-acting agent. This all begs the question: how did we ever arrive at the point at which we now find ourselves, in a mental health enterprise that seeks to remedy the broad complexity of human distress merely with medication and therapy methods, when neither are usually what are most beneficial? Depression is now diagnosed with greater frequency than throughout most of the twentieth century: its ‘prevalence’ has attracted an enormous cost associated with its ‘cure’, being the main condition for which antidepressant medication is prescribed.7 8 In Australia, where I live, antidepressant utilisation nearly trebled between 1990 and 1998, and has continued to increase.9 10 11 It is interesting to note that, of OECD nations, Australia is currently the second-highest prescriber of antidepressant drugs.12 Vastly more people are now being diagnosed with depression, and prescribed antidepressants, than several decades ago. Again, these developments have profound social, economic, and public health implications. Does depression have an adaptive purpose? If the answer to this question happens to be yes, what do we gain for a person by merely medicating them? Some emotions can create an intense state of self-absorption; we can become fused to our experience, so that all we can think to do is escape it or sublimate it somehow. Unfortunately, avoidance may only perpetuate the experience and will likely intensify it. Jung believed that depression foreshadows a potential renewal of personality or the readiness of a new page to be turned. How does it help to medicate a person in a way that merely dulls their senses and little else? To do so can be a form of collusion with avoidance, ensuring a worsening condition rather than remediation of one. Depression means literally ‘being forced downwards’, Jung would say, because we have become cut off from some things of importance within ourselves; and of course, what people often need to confront are their own corrosive, emotionally and physiologically debilitating fears. It has been said that if we do not exercise the power we have, it will slip imperceptibly into the hands of others; in can also fall into the ‘hands’ of our worst fears, which are then empowered to tyrannise us. Jung suggested engaging with our experience of depression: learning from it not getting rid of it; thus freeing us from the impossible expectation that things should be easy, that life should be always happy, and that we can just run away from things rather having to listen, learn, and work them through. 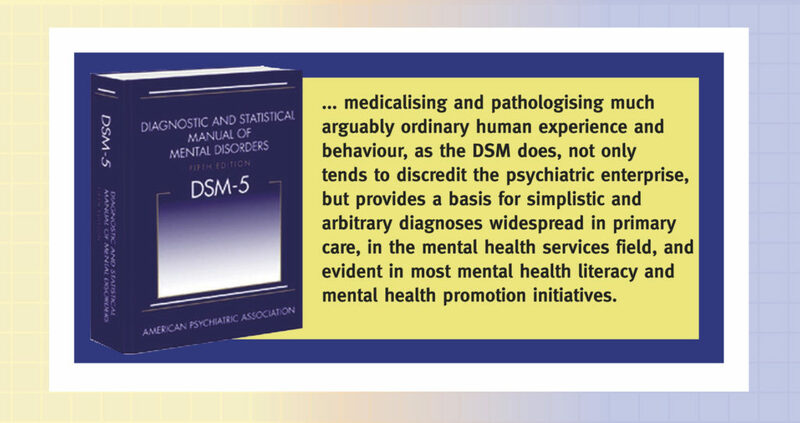 Editions of the DSM have always attracted controversy and criticism, including from many psychiatrists and doctors themselves; the most recent version (DSM V) is no exception. 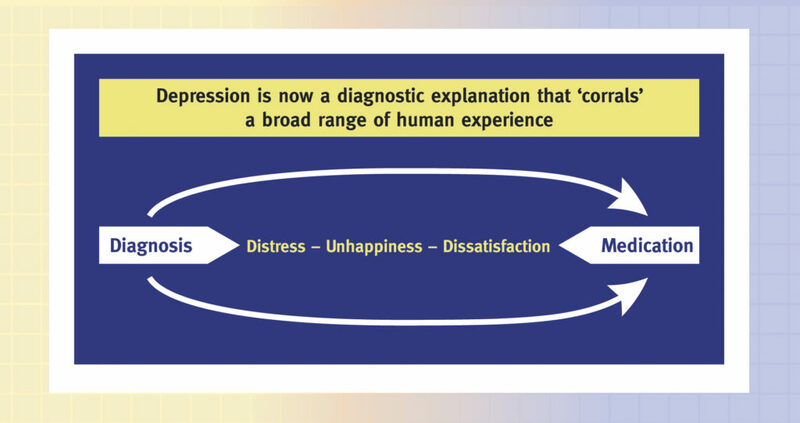 Criticisms include: lack of empirical support, a revision process and content influenced by the pharmaceutical industry, and an irrepressible tendency to medicalise and pathologise human distress — patterns of behaviour, mood, and experience for which a person may well need professional support, yet which do not constitute illness or disorder. 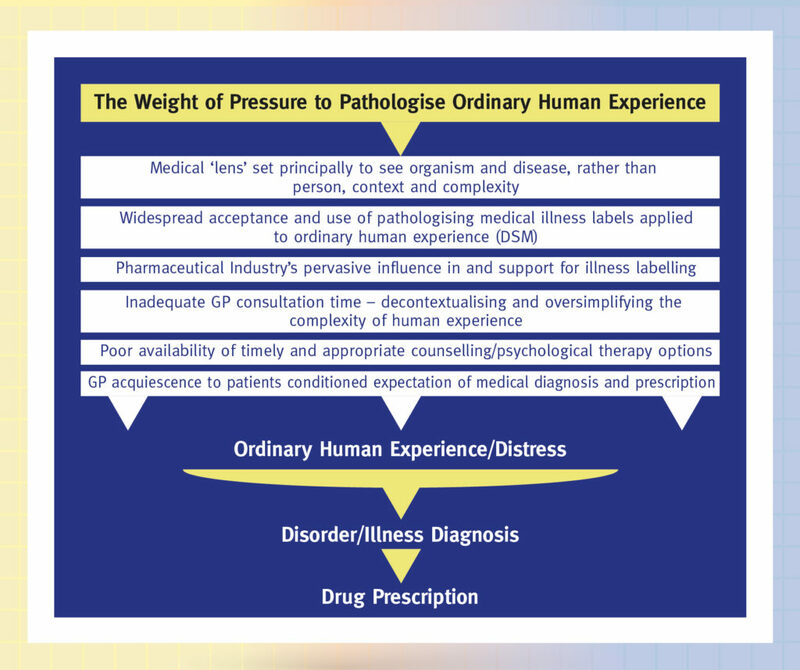 Whilst many GP’s do try and refer patients to psychological services (rather than just prescribing drugs), to be eligible for subsidised services, patients require a diagnosis that fits with the criteria of a recognised disorder or illness. The demand for such services is already overwhelming in many parts of Australia (which means some consumers must wait months for appointments); a dilemma now being targeted by short-term stopgap measures such as online resources and IAPT programs (Improving Access to Psychological Therapies), which are themselves problematic, and simply perpetuate an ailing model of mental health care. It is important not to be seen as trivialising in any way the human suffering caused by psychological distress or mental health difficulties; in fact, though it may seem somewhat counterintuitive, my purpose (consonant with what I call The Situational Approach, which I will explore in future blogs) is to reconceptualise human experience in a way that demands a greater regard for it and more appropriate and helpful supportive responses. And it needs to be said, there are cases of mental health difficulty that do warrant some medical intervention and perhaps the limited and evidence-based use of psychotropic medication — such as when people are put at risk or severely depleted in capacity because they have persistent, debilitating, and increasingly isolating mental health difficulties. However, by far the majority of psychological or mental health difficulties presently categorised within psychiatry and medicine as mental illness or disorder do not warrant this kind of pathological insinuation, and exhibit little positive response (if any) to medical or pharmacological interventions, and need to be addressed in quite different ways. When we approach a person with the purpose of detecting a disorder or illness in need of diagnosis and perhaps treatment, and we use the language which corresponds with this intent (that of disorder and illness), we keep the person at a distance from us: we isolate, simplify and circumscribe the meaning of their life, reducing it to a clinical entity, a psycho-pathological category. Not bothering with their history, the critical factors of their immediate environment, or the complexity of their experience in relation to these, we squeeze them into a depersonalising and reductionistic diagnostic mould that does not serve their best interests but those of presumed economy and convenience. When we unnecessarily intervene medically or pharmacologically, thinking we are being humane or helpful, we are in fact doing neither, and are more likely to be doing harm. Individuals have multiple potentialities, are resourceful, and have their own innate capacity for healing and transformation. Accepting a person as a whole means paying attention to their freedom, responsibility, and competence, and not rescuing them from their experience, but finding a way to supportively accompany them through it. This opens up possibilities instead of closing them off, which tends to occur if the person is not encouraged to maintain responsibility for their experience and to respond to their experience, which can reveal meaning and options hitherto unrecognised. This is true even in unalterably difficult circumstances. As holocaust survivor Dr. Viktor Frankl once said: we may have little or no control over some things that happen to us, but one freedom can never be taken away from us is the freedom to choose how we respond.20 Exercising such a choice is an act of power, one that can be a potent antidote to powerlessness which so commonly diminishes people’s mental health. Powerlessness can generate highly corrosive emotions, and is well known for cultivating chronic stress, insomnia, depression, anxiety, and patterns of suicidal thinking. Professor of psychology Miles Groth makes an important point when he suggests that we need to try and be careful to distinguish between what is developmentally appropriate and inevitable for a person, and what is genuinely threatening them with isolation and compromised function in everyday life.21 This is a vital distinction: in relation to the former we may need to humanely companion them through their experience, riding out their suffering with them, without trying to rescue them from it or helping them avoid it. In the case of the latter, we may have to intervene and offer an alternate route for them to try out. In discussing the content of this article with a psychiatrist recently, she offered the following rule of thumb for any professional assisting others with mental health difficulties: “Whatever a patient brings to me of their experience, I assume to be normal, and I continue to assume so unless there are compelling reasons to think otherwise.” Intrinsic to this normality is a capacity and expectation of self-responsibility, competence, self-discipline, restraint, and the dignity of causality. We need to be careful that in our desire to help, we don’t presume to rescue a person from the very experience that might otherwise give rise to an adaptive and helpful shift in their thinking and experience, depriving them of quality of life rather than enhancing it. Even in severe difficulty, people rarely need to be rescued from their experience, but may need to be supported and companioned through it so that they can be kept safe and respond to it adaptively. Diagnosing mental illness, in many cases, risks consigning people to psychological sedentariness and dependence on psychotropic medication. Given the near absence of efficacy of such medication (except in some cases of severe mental health difficulty), patients are unwittingly surrendered to the whims of their ‘condition’ and a revised self-narrative and self-identity coupled with a trajectory of undeserved dependence and frailty; they are encouraged to exchange an internal locus of control and autonomy for an external one; and we call this promoting mental health? Another way of conceptualising acutely challenging, difficult, and sometimes debilitating human experience is to recognise the role of complexity. If a person is overwhelmed with stressors (apparent causes of stress) and challenges beyond their adaptive capacity to keep everything under some sort of control and to maintain an internal equilibrium, and if they are severely decompensated by their experience, their weakest point of physical or psychological susceptibility is what will break down under the pressure; they will likely succumb in the direction of their greatest weakness, whether that means an undesirable gene is switched on, mood becomes disturbed, anxiety sets in as an intolerable burden, or a compromised immune response leads to sickness. This idea of complexity that overwhelms is useful to consider alongside the mental-health-diminishing effects of powerlessness; both cause much suffering. Both likewise respond well to companioned problem solving, purposive acts of power, and being able to achieve order, perspective, and a sense of feeling back in control. Exposed to yet assisted through such an experience, people may learn new skills and develop a greater capacity of resilience. It takes little imagination to understand why a 10-minute or even a series of 10-minute medical consultations will be an inadequate response to such complexity, or to understand why pharmacologic sublimation of symptoms will achieve little except to prolong a condition that is neither extraordinary, insurmountable, nor necessarily chronic in potential, given time, patience, and appropriate support. In Australia, as with other western societies, an emphasis on illness and drug treatment have eclipsed considerations of lifestyle change, self-help and psychotherapy, despite these being almost always more beneficial. For example, approaches such as light exposure therapy, structured daily physical activity, reduced alcohol consumption, a balanced diet, and measures to improve sleep.22 23 24 25 26 27 28 29 Too often, even when such measures are recommended to patients they are not a first-line approach but an adjunct to medication and are thus perceived as recommended but non-essential alongside the more medically definitive drug prescription. Since they also require more time and effort, they come a poor second to the presumed (and marketed) efficacy of a purpose-designed antidepressant drug. The big losers in all of this are of course unwitting consumers, tax-payers, and corporate insurance industry providers who carry a huge financial burden due to the present mental health system. All are bearing the brunt of an indefensible narrative of mental illness and a flawed model of mental health that show little regard for standards of evidence or ethical human service practice. 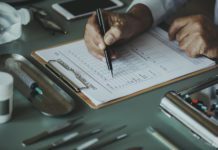 A significant consequence of an eagerness to diagnose mental illness in people experiencing psychological distress unfortunately turns up in the field of suicide prevention, and may well be putting people at greater risk of suicide. This is because suicide prevention initiatives, preoccupied with detection of ‘mental illness’ such as depression, often overlook and fail to address forms of distress that don’t constitute any kind of illness or disorder, and yet which can result in suicidal ideation (thoughts preoccupied with suicide) and suicide. The current mental illness narrative evident in mental health literacy messaging and commentary on suicide prevention has tended to reinforce the idea that suicide should, in most cases, be considered to be the result of mental illness or disorder. However, evidence does not support this claim. Whilst conditions like major depression may sometimes be implicated in cases of suicidal ideation and death by suicide, and are an important consideration in the design of appropriate preventative measures, this should not be considered license to assume an association between the two that is simply unsupported.34 Limiting preventive strategies to those built upon the unfounded presumption of mental illness or disorder will simply not help many, perhaps the majority, of those at risk of suicide. The experience of being human can sometimes be acutely distressing, even overwhelming and debilitating. Nevertheless, even when such experience tests the limits of endurance and adaptive capacity of the individual, it does not constitute a diagnosable illness but more a condition demanding the individual’s assiduous attention, acknowledgment of the imperatives of change and adaptation, use of self-help strategies, learning new insights and skills, a willingness to procure social support, and, when necessary, utilising the knowledge and skills of a professional counsellor or psychotherapist. By far the majority of mental health difficulties benefit most from these measures, not from medical intervention or psychotropic medication. It is not at all simplistic to suggest that much of our mental health system apparatus could be dismantled, and prescribing drugs especially for high-prevalence mental health difficulties could almost cease, if instead we opted for an evidence-based approach to dealing with human distress and psychological difficulty; an approach that acknowledges the innate capacity of each individual to recover from their distress and difficulty, if accompanied by timely and appropriate social and, if necessary, professional support. Madness is least of all to be found in individuals, but alas, it does characterise our present cultural and institutional approach to mental health. Dr. John Ashfield, formerly Principle Consultant at Rural Mental Health, Country Health SA, a division of the South Australian Health Commission, is a bestselling author of numerous books, essays and articles, and the pioneer of a number of widely recognised and awarded State and National preventative mental health initiatives. Thanks for the great article, John. If I had a suicidal friend or acquaintance I’d be hard put knowing what to do. I’m no fan of the bio model since it almost ruined my life. I would prefer to set up a “watch” with a couple other people to give comfort and hope to the sufferer. Kind of like they did for President Lincoln when his “blue pills” made of mercury didn’t cure his sadness. Medicalizing human distress makes people take it less seriously. One of those counter intuitive truths we seldom acknowledge. Instead of saying “Joe is sad because he lost his job,” folks say, “Joe’s depressed because he’s nuts and has a screwed up brain.” Depression and anxiety are real. But by brushing them off as brain diseases we teach Joe he doesn’t need to find a new job. Unemployment isn’t the problem. He is. Then marvel when Joe’s depression worsens. I found this summary really valuable. You mention the way that the pathologising approach actually prevents severe human distress being treated with the seriousness it deserves. I’d like to add that it also prevents the causes of severe distress from being taken seriously. This is another feature of psychiatry. If distress proves that the distressed are ‘defective’, it also proves that nothing much is psychologically distressing and damaging. It means that both cause and effect are located within ‘defective’ individuals. It is effectively a not guilty verdict for every form of oppression and abuse and sympathy and solidarity with harm doers, and with the harm itself. It enables the punishing approach to those who are most hurt from onlookers both inside and outside of psychiatry and encourages everyone to harden and turn away from suffering, inside and outside of themselves. No wonder the number of those showing ‘symptoms’ is growing exponentially. It is a marketers paradise. The legal system punishes crimes. Psychiatry punishes weakness. Assuming the person actually had that syndrome that still wouldn’t justify the “treatment” with a crowbar. Good point. Wittingly or unwittingly bio-psychiatrists enable abusers. Well said, Out and LavenderSage. I agree wholeheartedly. This is in my view the most serious damage psychiatry has done to our society. It has removed context from our suffering and made it a trivial matter, as well as making it an entirely individual problem, as if any upset or disagreement with our social system is proof of personal malfunction, and the system itself is flawless. When, in reality, if one studies our society’s current systems (be it the medical / pharmaceutical industrial complex, the banking system, the military industrial complex, etc. ), one does find that all our society’s current systems are satanic. I am having a problem here…psychiatry is not the only problem..
No, everybody does not want a quick fix. Some of us recognize that there is simply no such thing. I agree, LavenderSage, everybody does not want a quick fix. We want truth instead. Get rid of forced treatment, and you’ve quickly fixed much of what is wrong with the “mental health” system. The question remains, why imprison innocent people in the first place. In the name of health? You’ve got to be kidding. I’m imprisoning you to protect you from yourself and/or other people. Really? Not if I have anything to do with it. Life is a risk people should be allowed to take. There are no genuine quick fixes. There are stop gap measures–which psychiatry can offer many. Then there are slow fixes that actually work. Oh, “littleturtle”! I really do think I know what you mean, when you say that you want a quick fix, but that you can’t seem to find that fix.Please let me suggest that you are NOT BROKEN. I’d say that you’re entirely normal, given everything that’s happened to you! What worked for me, was being told that within myself, there is a whole, healthy, and happy person. Then, I had to look long and hard at that, and realize the TRUTH, that I really AM a whole healthy happy person. And hey, maybe I’m wrong about this, but I really do truly believe that YOU TOO, are a whole, healthy, and happy person. And reading some simple books by the Dalai Lama helped me to understand that I could let go of my “conditional happiness”, and have UNCONDITIONAL HAPPINESS. I can decide to be happy just because, for no real reason, other than my own deciding to be happy anyway. Today, I’m a happy man. Even when I’m unhappy for a while. Because I believe in the whole, healthy, happy person inside myself. Does that make sense? I’m always happy to see your short, simple, honest comments here. They can put as much money as they like in but they can only make matters worse (with the bio approach). If I was in desperate circumstances I might need help – but I’m not. Otherwise I seem to be quite happy! Mental illness is a myth. It always has been. Karl Kraus understood the charlatanry inherent in psychiatry before any of us were born. But no one reads Kraus, or Szasz. Hence, pervasive ignorance reigns, and the myth of mental illness dominates the collective consciousness. These aren’t new insights. It’s just that, like most truth, the insights are perpetually ignored, rejected, or ridiculed. Psychiatry is a pseudo-scientific system of slavery. The sooner it is abolished, the better. Hello again Dragon, Its a dead end! Good luck in your “quiet exit,” yeah_i_survived. Personally, when I left, I called it “The Great Escape.” Although, I had to escape both the church, as well as their “mental health” minion at the same time, since those industries are in bed with one another (the atheistic DSM is currently being taught in the seminary schools). Some lyrics that describe my “great escape.” But I, too, escaped with God’s assistance. “We can make it right, Throw it away. Forget yesterday, We’ll make the great escape. We won’t hear a word they say, They don’t know us anyway. Watch it burn (a local church roof did burn during my ‘great escape’), Let it die” (my childhood religion is committing “suicide,” according to others). I share your belief that God is the answer, but do be forewarned that the paternalistic religions and their atheistic “mental health” partners in crime are not. It is a shame the mainstream religions bought into the psychiatrists’ material world believing only, Holy Spirit blaspheming, multibillion dollar, iatrogenic illness creating, primarily child abuse covering up, “dirty little secret of the two original educated professions,” faustian deal. Hello. I’ll be praying for you. Off the drugs for well over a year, but struggling with weird physical problems. Occasionally I break down and see a doctor but they’re baffled. Plus my records read my “mental” history so I’m scared they’ll discover I’m a naughty runaway. Can’t absorb micro nutrients very well. Now I have spells of horrible itching and break out in welts. Hoping an alkalized diet will offer relief. My system is undoubtedly inflamed and out of balance. Weirdly enough this modern fake bio-model leaves out some other possible bio models as well. It’s like treating pain by sewing someone’s mouth shut so they don’t scream. At least the doctors don’t hear any crazy talk. People can become very miserable from physical illnesses and things like poor sleep. I saw one story about a woman who cured her son’s ADD by fixing his sinuses so he could sleep. It took a lot of detective work to find an underlying cause for his angst. But there was one. He was in constant pain and thought it was normal. This model is super lazy. It’s 14 years of med school for matching symptom A with drug B. I saw an article about a possible relationship between the immume system and shizophrenia symptoms. Someone got a bone-marrow transplant and it cured his hallucinations. The opposite happened as well. There is totally human distress from abuse and interesting ways people develop to cope with it which may not work forever. We don’t give people enough credit for interesting ways to heal or be. I enjoyed hearing about Carl Jung’s depression theory. It would make sense that some who experienced a psychotic episode would understand how to come out of darkness. I don’t understand how we got here but I hope we can leave someday and move on to Western medicine as a whole. The symptom A drug/surgery B model is many places. Pyridoxine (B6) probably works because the enzyme glutamate decarboxylase requires B6 to function. Glutamate decarboxylase is what converts glutamate to GABA and calms people down. The importance of Magnesium is that it regulates the transmission of the glutamate neurotransmitter (major excitatory neurotransmitter) by blocking the NMDA receptor. It will take a long time – many months into years – to get these victims of psychiatry okish due to the drugs, they should be very very slowly brought off them and all of them… I do not know ANY psychiatrist who really knows how to do this. It is only psych survivors who have been throught it who really know how to do it. Words of wisdom, streetphotobeing. And this is particularly true, since most of the psychiatrically drugged today are misdiagnosed/ stigmatized/ defamed/ discredited child abuse survivors, according to the medical literature. Why all this misdiagnosis of child abuse survivors by our “mental health professionals” today? Because no “mental health professional” may ever bill any insurance company for ever helping any child abuse survivor, unless they first misdiagnose them. It’s a shame our “mental health professionals” are not intelligent enough to understand that aiding, abetting, and empowering the child abusers/traffickers/rapists is not just illegal, but unwise. Since profiteering off of covering up child abuse crimes, on the massive scale at which today’s “mental health professionals” are doing this, will eventually destroy humanity. Turning lots of kids into brain damaged drug addicts is also unwise. But evil tends to be short sighted. I have a very good psychiatrist….he has helped me..
why trash everything about psychiatry…. how about bio/psy/soc/econ/pol…..model of cause.. I had a better psychiatrist recently but I’ve had many bad ones. My fiance sat in on one where I told the doctor I was feeling well and he suggested I take more drugs. Specifically one that’s on my chart that I’m allergic to. When I pointed it out he still tried to convince me it was the right idea. This psychiatrist is recognized as the best in the area. I think if there were more Kelly Brognans out there who were willing to put in a lot of effort into actually helping people things might be better. That hasn’t been my experience though. Perhaps if there was an easy guide like the DSM that was actually informative towards recovery and not “treatment” we might get somewhere. A lot of us have given up on subtlety though because people are dying and suffering. There’s a sense of urgency. I once wanted to be a psychiatrist to help unhappy kids like me…but I’ve never met a professional who would know a gentle enough intervention. I really…really just needed a friend, maybe more freedom. Somewhere to belong. But what I didn’t need was someone to tell me something was deeply irreversibly wrong with me. This was all I heard from both psychiatry and psychology. I was malnourished of love and pressured to succeed, but there must be something wrong with my DNA? Why do this to a person? TO “littleturtle”: I think your experience is valid. But I also think your experience is the exception, not the rule. “Madness is least of all to be found in individuals, but alas, it does characterise our present cultural and institutional approach to mental health.” Thank you, John, for pointing out the insanity of today’s psychiatric system. John, I liked your article and look forward to future contributions, but I wondered how the above, if I understood it correctly, can be applied to children who are subjected to abuse and trauma. Surely we don’t think of children under these circumstances as having experiences beyond their adaptive capacities, weak points, succumbing, susceptible or decompensating, but merely as children who are abused or traumatised. Furthermore, are we blaming these kids for not being resilient enough to deal with these experiences and that they should develop a greater capacity for it? A valuable article. Not much to add, though maybe a re-read will spark some sort of minor disagreement. All I would add is that the obvious reason for defining people as “ill” rather than suffering from the concrete realities of society is that (capitalist) “society” gets a pass, while the individual reacting to it is deemed the problem. Any question as to who benefits from that? Don’t forget those abused by partners or guardians. If a wife or teen looks stressed and out of it while the abuser is well dressed and knows what to say the shrink will blame everything on the abuse victim. True; don’t know if you’re distinguishing that from “society” (I don’t) or just making the point for good measure. Both. Your view of society was much broader. Social models differ according to size much like physical designs which cannot always be directly scaled. Thank you for this excellent article. It’s exactly what I experienced when steroids (taken with chemo) caused me to have insomnia. My only “symptoms” were insomnia and some anxiety (due to the horrible side effects of chemo) that nearly every person in cancer treatment experiences. Yet a psychiatrist ruled that being a cancer patient in the midst of grueling treatments was irrelevant and not a ‘situation’ or reason for insomnia or anxiety. Instead the insomnia was ruled a brain disorder and flawed character. It was stunning to realize psychiatry is exactly as you say, history, context and complexity of a person’s situation or environment are completely ignored. From what I read/ learned the last few months it is appalling that psychiatric patients are treated far worse than hardened criminals. As more professionals speak out, and psychiatric survivors report the harm they suffered and word keeps spreading to more people who were previously unaware of what goes on, hopefully governments and others in power will no longer ignore the injustices of the authoritarian regime psychiatry has become. I look forward to your future blogs in which you explore what you have termed “The Situational Approach”. I’m surprised that Dr. Ashfield made the tiny, but significant error, and NOBODY else noticed it! There’s no such thing as a “DSM-V”. It’s “DSM-5”. The APA dropped Roman numerals in favor of Arabic. Look at the picture above, DSM-5! And, the DSM is really a catalog of billing codes. ALL of the so-called “diagnoses” in it were INVENTED, and NONE of them were discovered. If so-called “mental illnesses” really were as “real” as the psychs want us to believe, than they would have been discovered, not invented. So-called “mental illnesses” are exactly as real as presents from Santa Claus, but not more real. They are “STD’s”, – socially transmitted disorders. The DSM is just an excuse to $ELL DRUG$. More different diagnoses, more drugs to sell. A diagnosis and a drug for everybody! And PhRMA is laughing all the way to the bank! There’s another glaring perceptual and cognitive error on Dr. Ashfield’s part. Despite the plaintive cry of the politicians and the media, there is in fact NO concern on the part of “BigGOV” and industry to “cut costs”, or “save money”. Given the Central Banks that all countries have, it’s FUNNY MONEY, or fiat currency. No, they really do NOT care how much money it costs. Dr. Ashfield ignores (due to economic anosognosia, no doubt! ), asking the question of WHO GETS all that tax money? Almost NONE of that money is going to the poor “mental patient” on government “benefits”, but the salaries of those employed in the system only rise, and PhRMA’s profits only ever grow. If the motive was truly to help people, wouldn’t pharmaceuticals be required to be only on a “non-profit” basis? Like ANY business in our current late-stage capitalism, it is designed to ONLY GROW. More mental patients, more drugs, more drugs, more mental patients…. And I know, from contacting the head of my former religion, and from checking out a seminary where they are teaching the atheistic material world believing only DSM, that the religions are in bed with the “mental health professionals.” And neither the religious organizations nor the “mental health professionals” want to get out of the business of creating “mental illnesses” in people with the psychiatric drugs. Because “it’s just too profitable,” according to one pediatrician I asked to stop psychiatrically drugging our children. But you’re right, what the doctors and religious leaders don’t seem to understand is that the war mongering and profiteering, bailout needing, fiscally irresponsible, “too big to fail” globalist bankers’ have destroyed the value of our currency. Or, as I mentally ‘screamed’ at the Chicago Federal Reserve, during a drug withdrawal induced “manic” walk down Chicago’s Mag Mile. “Greenspan spanned the green to the point it’s ‘irrelevant to reality. '” Everyone’s name has meaning, as the God fearing Jewish people know. You can take the ethical banking families out of the banking business, but you can’t take the knowledge of the banking industry out of the ethical banking families. This is a valuable and comprehensive article, but lacking in important ways. I am glad to hear that a series is forthcoming, and look forward to hearing more about political aspects like intersectionality, and action steps to take to remedy the system, both by professionals and those with lived experience. The intersectionality is crucial to a basic understanding of emotional distress and was considered very little here. For me, one of the biggest problems with modern mainstream psychiatry is that it is a distraction from real societal causes of distress and trauma, on both individual and systemic levels. Failure to address this in the article is a major omission, in my opinion. If one outlines a system to raise consciousness of the issues without providing valid alternatives in detail, what’s the point? “Intersectionality” is a term that primarily is used by liberals/neoliberals and does not truly address capitalism. Various forms of oppression do not just happen to “intersect,” in this day and age they all serve the same interests, i.e. the accumulation of obscene wealth by a tiny few. I do agree with you in general of course, the source of people’s misery is to be found in the political/social structure and that is what we must correct, not people’s natural responses to its exploitation. The alternative to oppression is no oppression, not an “alternative” form of oppression. What would would be “valid alternatives” to concentration camps or slavery, other than total abolition? I think you harbor a residual belief, maybe unconscious, in the idea of psychiatry as a “failed” system of support, when it is primarily a police force. After being in contempt of Parliament a few days ago Theresa May has abscoded with 39 billions worth of crown jewels to the EU, and is actively trying to flog our country. Clearly she has committed treason and needs to be arrested and placed in the Tower of London as soon as she sets foot back in the UK and until John Bercow can restore order. Now where are those 48 letters Captain Mainwaring ? Wow! That looks like a Monty Python sketch without punchlines or songs. Oh dear! I’m the loud American who married a Brit. This is literally my house every day. Really nice article, thanks for sharing this. I disagree that this is simply the psychiatric system doing this. Medicine pathologizes everything it doesn’t understand as psychiatric/psychosomatic. And society (politicians, media, art, experts, etc) reinforce this narrative constantly. No KS, not just the psych system. But this pseudo-science invented solely to destroy/sterilize “criminal types” has infected all the legitimate medical branches as well. Psychiatry is the cancer of medicine.